Thank you for signing the Guest Book for Eileen M. Berkes. The MidWeek News and Anderson Funeral Home thank you for signing this Guest Book. For additional details on the funeral home (directions, service arrangements, pre-planning), click here. This Guest Book will remain online permanently courtesy of Anderson Funeral Home. Please take a moment to sign the Guest Book for Eileen M. Berkes. 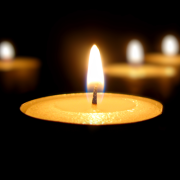 All of us at Save-A-Pet were so deeply saddened to hear of the loss of such a loving person. Eileen’s compassion for the cats at Save-A-Pet was beyond comparison as was her kindness to everyone she met. She was a devoted volunteer in many aspects who always ensured the cats had an abundance of love and affection. Words cannot describe how much all of us will miss her. Her family is in our thoughts and prayers. In loving memory of a kind person and friend to the kitties. so sad to hear if this. Eileen was a great childhood friend. Hugs to the family. Send me a daily email when updates are made to the obituary or Condolence page for Eileen M. Berkes.